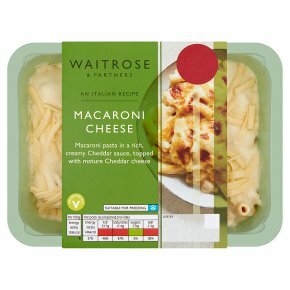 A mature Cheddar cheese sauce on a bed of macaroni pasta topped with grated mature Cheddar cheese. INGREDIENTS: Cooked pasta (water, durum wheat semolina), milk, mature Cheddar cheese (milk) (18%), water, single cream (milk), rapeseed oil, fortified wheat flour (wheat flour, calcium carbonate, iron, niacin, thiamin), cornflour, salt, mustard flour, ground white pepper, spirit vinegar, ground turmeric. Stir before serving.. Do not reheat once cooled.. For best results oven heat. Stir before serving. Do not reheat once cooled. For best results oven heat.